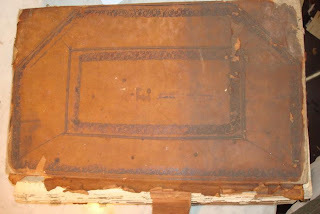 We've had some interesting books in from a county archive dating back to the early 1800's. 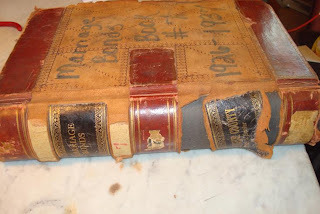 In addition to mending and resewing the textblocks, we rebuilt some very interesting historical bookbinding structures. 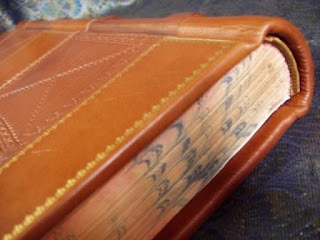 The most unusual is the springback, which features a hard curved spine that wraps around the textblock. 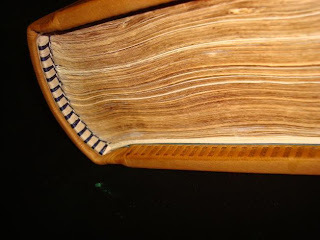 When the book is opened, the pressure of that curved spine board throws the pages open all the way to their inner margin, a great convenience for the clerk. When closing, the "spring" opens slightly and then as it flexes back shut, pulls the textblock back into that curved hollow. 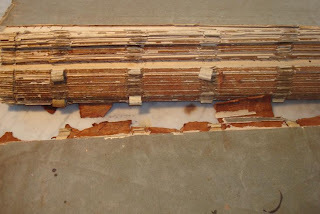 They are rarely seen today, and require a number of specialized reinforcements across the inner joints. 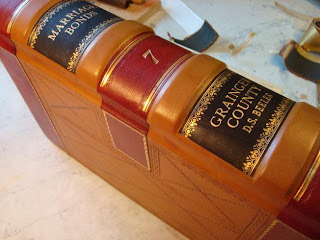 We built a model years ago as a visual aid, but typically take note of how each book was built and simply copy the original structure as we rebind. 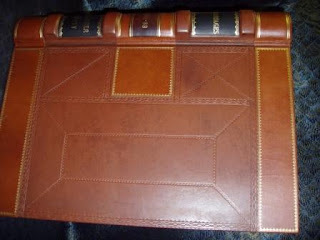 Besides the structural uniqueness (much of which remains hidden), many ledgers from this era feature beautiful leatherwork with extra colored panels and tooling, both in blind and gold.